Slobodan Milosevic was president of Serbia (a republic, or member state, of Yugoslavia) from 1989 to 1997 and president of Yugoslavia from 1997 to 2000. In 2001 he was sent to stand trial at the international war crimes tribunal (court) in The Hague, Netherlands, for his actions during the civil war that occurred in Yugoslavia during the 1990s. Slobodan Milosevic was born on August 20, 1941, in Pozarevac, a small town near Belgrade, Serbia, the capital of Yugoslavia. Slobodan was the second of two sons of Svetozar and Stanislava Milosevic. His ancestors belonged to the Vasojevici clan from Montenegro, another republic of Yugoslavia. His father finished Eastern Orthodox seminary (a place where people study to be priests) in Cetinje, Montenegro, and then studied at the School of Theology in Belgrade. His mother was a teacher in Pozarevac. People remember her as a strict, hardworking woman and a devoted Communist (a person who believes that goods should be owned and equally distributed by the government). When Slobodan was young, his parents separated and his father went to live in Montenegro. It is believed that his parents both eventually took their own lives—his father in 1962 and his mother in 1973. Milosevic finished his elementary and high school education in Pozarevac. According to his teachers and classmates, young Milosevic was an outstanding high school student, always attentive and always neatly dressed. Although quiet and solitary, he was politically active and published several of his writings in the local high school journal. While still in high school, Milosevic met his future wife, Mirjana (Mira) Markovic, whose family ranked among the most prominent Communists in Serbia. Her father was a hero from World War II (1939–45; a war fought between the Axis [Germany, Italy, and Japan] and the Allies [the United States, Britain, China and other nations]). Her uncle later became one of the leading politicians in post-war Serbia, and her aunt was a personal secretary of Josip Broz Tito (1892–1980) who was the Communist president of Yugoslavia from 1953 to 1980. The young couple's friends did not doubt that the love between Mirjana and Slobodan was sincere and genuine—theirs was a bond between two similar souls. They raised two children. In 1960 Milosevic was a law student at the University of Belgrade. He was an excellent student who was active in the university section of the League of Communists (the official name for the Communist Party), where he met Ivan Stambolic, a nephew of one of the most powerful Serbian Communist leaders. Many believe that it was Stambolic who elevated the political career of Milosevic. In 1964, after graduating from the university, Milosevic was appointed as an economic adviser and a coordinator of the information service in the government of Belgrade. In 1968 he became a deputy director of a state-owned gas company, Tehnogas. 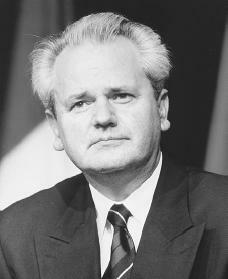 After Stambolic left Tehnogas in 1973 and became the prime minister of Serbia, Milosevic rose to the post of director. Five years later he became president of the powerful Belgrade bank Beobanka. In 1982 he became a member of the collective presidency of the League of Communists of Serbia, and two years later a chief of the City of Belgrade Party Organization. The collective presidency of the League of Communists of Serbia elected Milosevic as its president in 1986.
building to speak directly to Milosevic, they were beaten back by the local police. Milosevic strode out and shouted to the crowd: "No one has the right to beat you!" These simple words changed the structure of Serbian politics. Shortly after, in a series of heated sessions of the League of Communists of Serbia, Milosevic succeeded in removing Stambolic and his associates from the Serbian political arena. In 1989 Milosevic became president of Serbia. The disagreement among Serbia's Communists over the Kosovo province shook the already crumbling Yugoslavia. After Serbia took back authority over the self-governing provinces of Kosovo and Vojvodina, the prospect that Serbia might dominate all of Yugoslavia fueled nationalism (a patriotic desire for one's people to have its own nation) in the Yugoslav republics of Slovenia and Croatia and gave a boost to secessionist movements (or movements to withdraw from a nation). Following the collapse of the League of Communists of Yugoslavia in 1990, multiparty elections were held in each of the six Yugoslav republics. While Milosevic and his Socialist Party retained power in Serbia, forces that openly desired secession from Yugoslavia came into power in almost all other republics (with the exception of Montenegro). The nationalist emotions that spread throughout Yugoslavia inspired ugly memories among Serbs who had been subjected to genocide (the intentional destruction of a people by mass murder) during World War II. Milosevic, who had already established himself as the leading champion of Serbian rights, was the natural ally to more than two million Serbs living outside the borders of Serbia. When the talks among the various Yugoslav republics were called off in 1991, the violent breakup of Yugoslavia was near. The collapse of Yugoslavia and the resulting civil war among the breakaway nations brought new attention to Milosevic. In the fighting that began in April 1992, Milosevic avoided personal involvement, leaving Serbian military groups to carry out attacks against the newly established nations of Croatia and Bosnia-Herzegovina. Nevertheless, many critics, particularly in the West, portrayed him as a merciless tyrant who wanted to create a greater Serbia. At the same time, Milosevic and his Socialist Party appeared to be secure in their Belgrade headquarters. By late 1995 United Nation-imposed sanctions had destroyed the Serbian economy, and Milosevic agreed to a peace plan during talks at an air base in Dayton, Ohio. He attempted to rebuild his image, since he was thought by many to be the force behind war crimes and millions of deaths. Milosevic began making strides at winning a more favorable public opinion, calling for tolerance, or respect, among ethnic groups and portraying himself as a heroic and peace-promoting defender of Serbs. Despite the near-40 percent unemployment and the overall decline in quality of life among Serbs, he was able to retain supporters. In 1997 Milosevic's second and final term as president was at an end, but he hoped to continue his presidency by using a legal trick. On July 23, 1997, he changed his title from president of Serbia to president of the Yugoslav federation (which now consisted only of Serbia and its junior partner, Montenegro) in an attempt to retain his term. Then, in 1999, Milosevic refused to withdraw troops who were trying to stop an independence movement in Kosovo. In retaliation, the North Atlantic Treaty Organization (NATO), led by the United States, bombed Serbia for two and a half months. Serbian forces, nonetheless, caused a significant amount of suffering in Kosovo. On July 7, 2000, Yugoslavia's federal parliament enacted changes to the country's constitution that would allow Milosevic to serve two more four-year terms. However, Milosevic resigned in October 2000 because of the massive popular revolt against him. Six month later, Milosovic was arrested by police after he threatened to kill himself, his wife, and his daughter. Only two months later, in late June 2001, he was sent to The Hague to be tried for war crimes, including genocide. Cohen, Leonard J. Serpent in the Bosom: The Rise and Fall of Slobodan Milosevic. Boulder, CO: Westview Press, 2001. Doder, Dusko, and Louise Branson. Milosevic: Portrait of a Tyrant. New York: Free Press, 1999. Sell, Louis. Slobodan Milosevic and the Destruction of Yugoslavia. Durham, NC: Duke University Press, 2002.